Looking for some inspiration for your mobile marketing? One of our favorite examples is an oldie but a goodie. 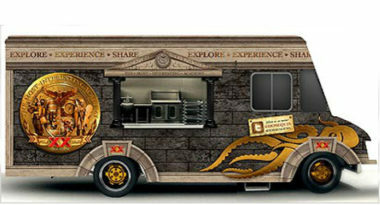 Riding the explosive popularity of food trucks, Dos Equis launched a mobile marketing effort a few years ago called the Dos Equis Mobile Academy that placed food trucks in major cities nationwide. The mobile marketing initiative played off the beverage brand’s “Most Interesting Man in the World” tagline and was designed to boost consumer engagement by offering interesting experiences to people who interacted both in-person and via their smartphones. The (delicious looking) food trucks carried out that goal by offering adventurous specialties in each city, such as grilled kangaroo in Houston and alligator tail empanadas in Miami, along with a unique local cultural ritual explained by the truck’s culinary ambassadors. The seven food trucks comprising the The Dos Equis Mobile Academy hit the seven cities across the country during the lunchtime rush of 11 a.m. to 2 p.m. The trucks debuted in Chicago and then rolled into Miami, Phoenix, Houston, Dallas, San Diego, and San Francisco. Throughout the campaign, Dos Equis promoted a “Stay Thirsty Grant” mobile marketing contest that rewarded thrill-seekers with the opportunity to win a prize of up to $25,000 to make their wildest dreams come true. The mobile initiative was promoted at MostInterestingAcademy.com and on Twitter at @DosEquis. To learn more about the latest trends in mobile marketing, contact MDG Advertising today at 561-338-7797 or visit mdgadvertising.com.